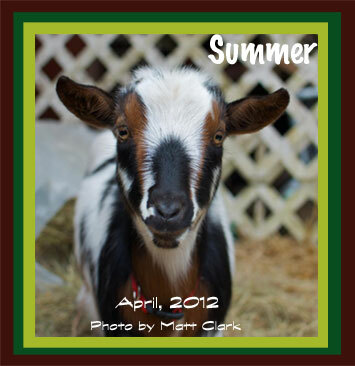 These pages have been set up to talk about the adventures and misadventures of our life with goats. These are not just any goats, but Nigerian Dwarf goats, the littlest dairy goats. Yes, dairy. Ours earn their way by providing milk for ice cream and cheese. That is the material gain. However, nothing can match the emotional gain of the love and attention these little goats give us. You will find many links to other sites here for more information about these sweet little goats in general, but first, about mine. Capri is Summer’s mother and was due to kid at the end of the month. Summer is one of triplets born a year before I bought her. She was the single doe with two brothers. Summer was left with her mom and was dam-raised versus being taken from her mother and bottle-fed. Dam raised versus bottle fed is a controversial subject among goat owners with both having valid arguments – mine are dam raised whenever possible as my core belief is that mother knows best how to care for her own babies, human, goat, dog, cat, etc. ; I need a good reason to separate babies from moms. However, each person must do what is best for her/his own circumstance after considering all factors. It is often said that the best thing about goats is how smart they are and the worst thing about goats is how smart they are. Early on, I found that to be very, very true. 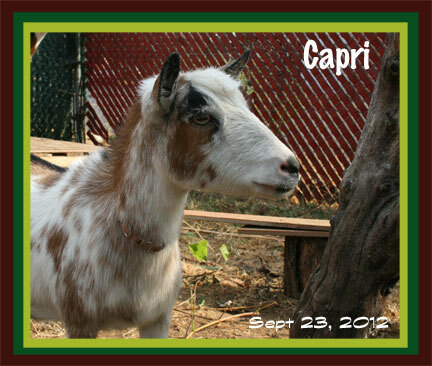 Capri is exceptionally smart even for a goat which she proved repeatedly. It seemed that she could get into more mischief than a kid! Capri would readily come to me while Summer was quite shy and reserved. Summer liked to spend more timing looking over the situation. Capri was to be my milking goat after her babies were born. She had never been milked before and I had never milked a goat before. I was very soon to learn that milking a goat was quite different from milking a cow. I think you are the lady that I met at the goat cheese contest at the Clark County Fair. I am interested in buying some of your Nigerian goat milk if you have any for sale. Where are you located and what is the cost of your milk? Thank you for the email, Joan. I was at the fair though I did not enter this year. Please accept my apologies for not having responded sooner – I usually receive a message there is a message here but apparently did not this time. In the state of Washington, it is not legal to sell raw milk unless it is from a certified dairy so I could not sell you milk even if I had extra. Our law no longer uses the word “sell” since the incident at Dee Creek Farms several years ago when they were working around the law and selling herd shares and several children got very, very ill. Now it is not legal to “transfer” raw milk which means we cannot give or trade either. If you want Nigerian Dwarf goat milk, you might be able to find some in Oregon because they can sell there from a limited number of dairy animals. ND milk is more difficult to find because most who have dairies want the higher production of the larger goats. Conway Farms is one source of raw goat milk; I think there are two other in Clark County as well. I wish you much luck in your search. Help! My goats are foaming at mouth and not moving! Julie, I am sorry but I am not a vet or even a vet tech. This is something you should call your vet about. If you have activated charcoal, try to get that into them while you are waiting. That is supposed to absorb toxic substances in case they ate something toxic to them. There are several goat-based facebook groups that might have folks that can help. I wish you the very best with your four-legged family members.